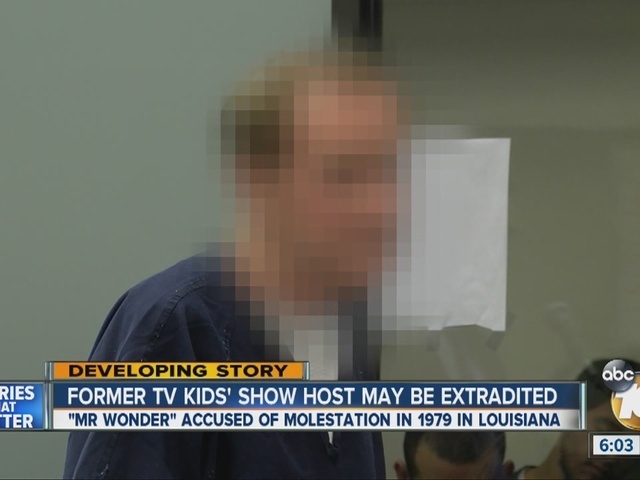 A one-time Louisiana television personality, who was on the lam for 37 years after being accused of sexually assaulting children on a camping trip, pleaded not guilty Wednesday to a fugitive charge and asked for an identity hearing for prosecutors to prove that he is the man wanted in that state. Frank John Selas, 76, was ordered held without bail pending a hearing Feb. 11. "There's a warrant, which may or may not be valid from 1979," said Marc Carlos, Selas' attorney. "I need to see that warrant. I need to see whether there's any legal challenges to it. We need to see whether the warrant is valid before he can make that decision whether he wants to waive extradition and then litigate these charges in Louisiana." Selas was taken into custody Monday in the Bonita area, said John Poplawski, a spokesman for the U.S. Marshals Service, which apprehended the longtime fugitive. Some of Selas' family members were in court today. "It's a very, very touchy subject," Carlos said outside the courtroom. "This is a shock to everybody." The attorney read a statement from Selas' family, who asked the media to respect their privacy. "Despite the allegations, for 37 years Frank Selas has been a loving husband, father and grandfather," the statement read. "He's always provided for his family. He's well loved and respected by his family, friends and the community in San Diego." Carlos said investigations of child abuse cases were a lot different in 1979 than now.